Who wouldn’t want to add some pink bubbly to their day? And if you need a reason Valentines day is just around the corner. May I suggest Pink Panda. A sparkling pinot noir rose’ from Alexander Valley, California. It’s a pretty pink demi sec or semi-sweet bubbly made in the charmant method which is the method of sparkling winemaking Italians use to make Prosecco. You will find smaller zesty bubbles busting with lively fruity tones of strawberry and red raspberry. But it doesn’t end there. Naked Rebel Winery, the winery with a bootlegger’s heart and a pioneer’s gusto, added a very special twist. The images on the bottle glow in the dark..yes, the label and Panda glow in the dark. 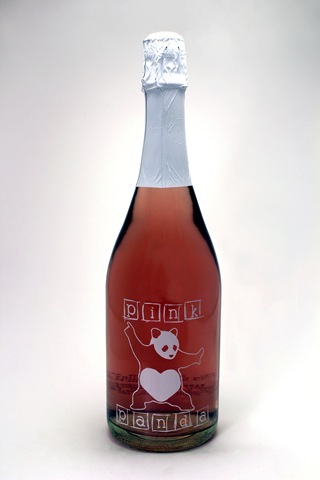 Grab this great fun pink bubbly that glows in the dark. Like this classic Chocolate Mousse. And a little romance with a movie like…. An Affair to Remember. Viola’! But trust me this isn’t the no fail Valentine recipe Naked Rebel Winery had in mind. Only 400 cases so order now at Naked Rebel Winery.